Description of baffles at baffle designs. The rubber I use is imported from Germany and contains no plastic in it's composition. 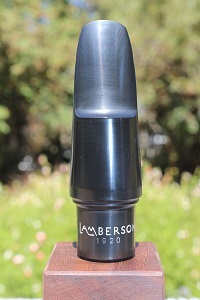 Mouthpieces with added plastic make the sound brighter and edgier, but have a notable lack of warmth and control. 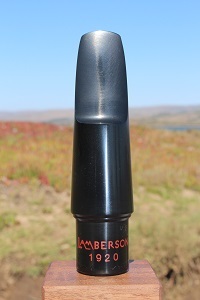 Rubber creates a rich warm sound that resonates freely, even with the DD baffle. Other good qualities of rubber are that it plays well in tune and can be played in a variety of styles and dynamics. Also the pitch is less stable whereas with rubber it's spot on even when you blow hard or are a blow hard. The 1920 rubber, also from Germany, is a formula from the year 1920. It has a richer darker sound, but more resonant and responsive. Acetal is a type of nylon that sounds great, in my opinion, unlike the other kinds of plastic used in mouthpiece manufacturing. It is louder, stronger and brighter than rubber, but not as warm. Response is a little stiffer. The wood I use is African Blackwood from a government run reserve in Tanzania. It is an exotic wood and used for most woodwind instuments like the clarinet and oboe. Like the sirens in Greek Mythology, it is beautiful and luring, but dangerous ... it's prone to cracking and warping. I deal with it by sometime having to reface the piece up to three times. That is included in the price except for shipping.